RECAP! Kunchenko Brawls Past Alves! Ultimate Fighting Championship (UFC) Welterweight strikers Thiago Alves and Alexey Kunchenko dueled last night (Sept. 15, 2018) at UFC Fight Night 136 inside Olimpiyskiy Stadium in Moscow, Russia. It’s been many years since Alves contended for the Welterweight title opposite Georges St. Pierre, but the Muay Thai wrecking machine remains an active fighter today. As of late, Alves has spent his time trying to kick his way past fellow veterans or up-and-comers. Filling the role of prospect opposite the Brazilian was Russia’s Kunchenko, a hard-hitting kickboxer who was looking to prove his talents on the big stage. Kunchenko didn’t begin his MMA career until later in life, which added a bit of pressure on “Wolverine” to impress last night. The newcomer took the center of the cage early, but Alves answered with solid low kicks. Before long, Kunchenko began to establish the jab, and the Muay Thai vs. boxing match up materialized from paper to inside the Octagon. At first, Alves was finding more consistent success, landing low kicks commonly and mixing in the occasional punches. However, Kunchenko did begin finding a home for his right hand, and the exchanges consistently heated up as the round wore on. The opening five minutes were very closely contested. Alves continued to work behind the jab and kicks into the second, though he mixed a more active body kick into his attack as well. Kunchenko responded with by kicking more himself, and his counter right hand was scoring too. For the most part, the two exchanged hard blows rather evenly. Alves’ tight guard and defense were on display, but Kunchenko’s quickness and power still had noticeable effect. The most effective weapon continued to be Alves’ low kick, which was buckling the Russian’s lead leg and doing obvious damage. It was a competitive but clear round for the UFC veteran. Possibly down heading into the third, Kunchenko had to turn it up. At first, it didn’t seem likely, as the Brazilian continued to slam him with hard kicks and keep him on the outside. In fact, it was Alves pressuring now, keeping Kunchenko on his back foot as he continued to ram his legs and body with heavy kicks. At about the halfway point in the round, something changed. Kunchenko seemed a bit more comfortable despite their mutual fatigue, and the momentum soon shifted as a result. Pushing forward, Kunchenko’s 1-2 snapped Alves head back repeatedly, and he closed distance further into clinch. From that range, Kunchenko landed hard knees and a brief takedown. The Russian finished the fight very strong. Ultimately, it was enough to see his hand raised. Some will argue home cooking — an argument I’m not completely against — but the decision did hinge on a very close first round. Kunchenko definitely showed both his skill and position on the roster in this match up. His hands were fast and dangerous, piercing the generally solid defense of Alves many times. In addition, Kunchenko showed off both his toughness and aggression, pushing through difficult moments and a battered leg to win a competitive fight. As for Alves, the longtime veteran has nothing to be ashamed of. He fought well against a game opponent, and more than anything else proved that there’s plenty left in the tank for Alves. No matter how many times we get to see it, it’s a joy to watch Alves destroy legs and buckle knees. “Pitbull” is still very worth-watching. Last night, Alexey Kunchenko battled his way to a hard-fought victory. Who should the Russian face next? For complete UFC Fight Night 136 “Hunt vs. Oleinik” results and play-by-play, click HERE! Daniel Cormier, once again, is the UFC light heavyweight champion. While he was re-gifted his 205-pound title last summer, thanks to the drug-testing net that once again snared bitter rival Jon Jones and scratched a knockout loss from the record books, “DC” had yet to defend his belt. Cormier laid waste to “No Time” at the UFC 220 pay-per-view (PPV) event last weekend in Boston, Mass., and will now look forward to ruling the light heavyweight roost in the second half of 2018. But don’t expect him to be pining for a Jones trilogy, based on comments he made at the UFC 220 post-fight press conference (via Express Sport). He might have to do it against this guy. 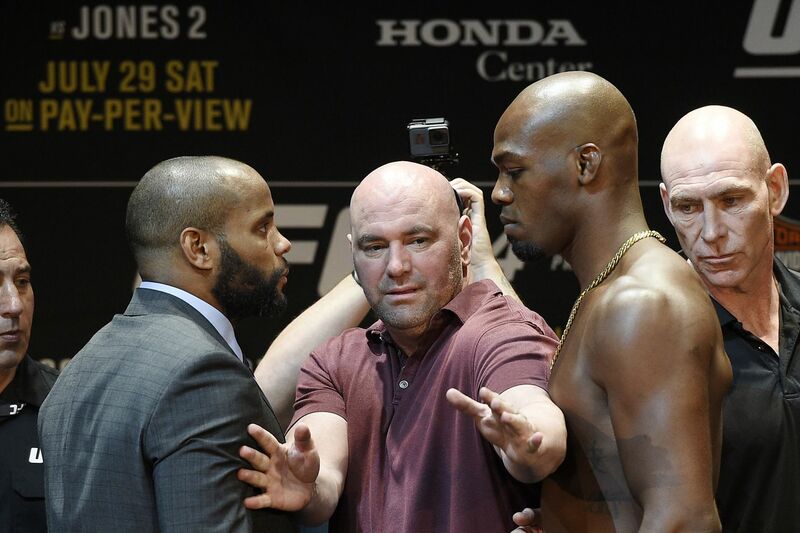 Cormier has already faced Jones twice and came up short both times. After losing a unanimous decision at UFC 182, “Bones” stopped “DC” at UFC 214. That’s not really the issue, it’s the other stuff that comes along with it, like hit-and-run accidents and failed drug tests. Not that it matters, as it’s still too early to start talking about Jones’ return until this gets handled. Patricky Freire outpoints Benson Henderson to split decision in Bellator 183 main event on Saturday in San Jose, California.